Have you ever stumbled across the strange ruins in the Crum Woods? At first glance, these crumbling walls just seem creepy. But don’t run away- this area actually has a long and fascinating history, involving magnificent mansions and dating all the way back to Pennsylvania’s founder, William Penn. 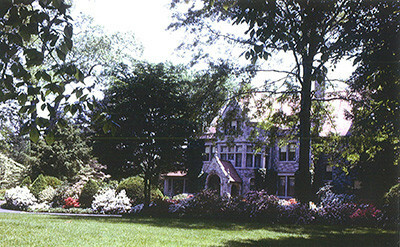 In 1927, Lytlecote was bought by Ward Hinkson and his wife Edith, and renamed Oak Knoll. The Hinksons would go on to construct an elaborate estate over the 32 acres, turning their home into an iconic site in the area. This included a swimming pool, a private arboretum, and an Italian Water Garden complete with a fountain. In their gardens, the Hinksons and their six gardeners cultivated boxwood hedges, roses, tree peonies, rhododendrons, and Exbury azaleas, among others. They also planted an abundance of trees, including Norway spruces, white pines, a double-flowering dogwood, golden-flowered fringe trees, a lace leaf maple, and flowering cherry trees. Five greenhouses stood near the house, where the Hinksons grew twelve varieties of orchids commercially. Around 100,000 of these orchid flowers were cut and sold each year. In 1964, the Hinksons sold much of their land to be turned into suburban homes. However, the real demise of Oak Knoll came with the construction of the Blue Route Highway (Interstate 476). The estate was demolished to clear the path for the new road. In preparation, all 73,000 of the Hinksons’ orchids were sold at auction and their greenhouses were dismantled. By 1967, the Hinksons had moved to a new home in Upper Providence and construction of the Blue Route began. The highway would be completed in 1992. Today, little remains of the Hinkson’s elaborate estate. However, the ruins of Oak Knoll’s Italian Water Garden can still be found in the Crum Woods. They are now known as “the Crum Ruins,” “the sunken gardens,” or simply “the ruins.” The ruins consist of the stone walls and steps of the water garden, whose stonework is weathered but not seriously damaged. The college has filled in the small central pool with soil to avoid liability. These ruins are a popular destination for hikers, joggers, and bikers on the Leiper-Smedley trail. This paved path, which is over two miles long, runs from the Thomas Leiper House to Smedley Park. Visitors can still see many of the plants that were cultivated at Oak Knoll, including flowering cherries, yews, white pines, a sourwood, a cucumber magnolia, Japanese pachysandra, large-flowered, sessile, and yellow trilliums, and an abundant akebia vine. These ruins are an important part of local history in a beautiful natural setting. For the adventurous hiker, they’re definitely well worth a visit! Marissa – is there an on-line map showing where the ruins are? Unfortunately, the ruins are not shown on the trail maps. They are located off of the Leiper-Smedley Trail walking from the Avondale Road access point. You can just barely make them out on Google maps. Draw a line due west from the north end of the Swarthmore College track. Zoom in on the edge of the woods before the Leiper trail and 476. Thanks Andrew. I didn’t think about looking at google. There used to be two brick pits (possible cisterns?) along a disused high path near the Sunken Gardens heading toward the trestle. One had been filled up but the fill had settled a few feet but the other was a 9′ deep, 7′ round chamber with a domed ceiling and manhole sized opening. Very mysterious and dangerous, I always wondered what they were for. I was under the impression that it is still private property, as is the existing house, driveway, and field thereby. The ruins are in the woods along the trail. The entire property is owned by the College and thus private property. The trails are open for visitors to hike but the field which holds our compost, nursery, and other equipment is not along with intact home at the top of the driveway (also part of college property). The ruins can be accessed off of the Leiper trail and are not accessible by vehicle. I hope this helps.